"This is the Christmas Tree Ornament I made. 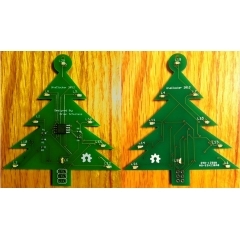 It’s a custom PCB that I designed in the shape of a Christmas Tree. The little 8 pin black chip you see on the front of the board is an Atmel ATTiny45 Microcontroller. It has 5 IO pins, and there are 20 LEDs on this board. Each LED is individually addressable through a clever trick known as Charlieplexing." Cool stuff guys! Thanks for sharing. Wow cool! Something to look at for this Christmas.